This is one simple and hazzle free dish for breakfast and done within few mins. 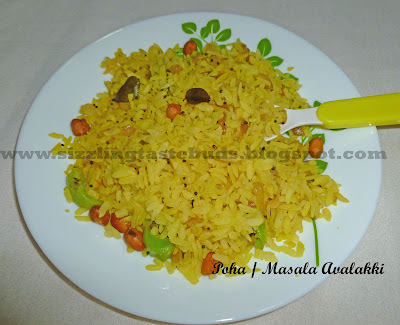 My husband likes this Masala Poha than the regular one which we prepare only with coconut and jaggery. During his stay in NL, he has just survived with this Poha, bread and egg, and ofcourse bachelor's special Maggie noodles for breakfast. At weekends, I too become lazy and just forget about getting early in the mornings. But once I start my day, the first thing comes into my mind is "What's for breakfast today?". Oh! Then finally I end up with this simple Masala Poha. 1. Wash this Avalakki and drain the water from it and leave it untouched and continue with other preparation like chopping onions and chillies. Since we use thick Poha to this recipe, it should get soften. 2. Heat 2 tsp oil in a kadai and add Mustard seeds. When these starts spluttering add curry leaves and green chillies. 3. Reduce the flame and add groundnuts. When groundnuts gets roasted add chopped onions and fry till they become translucent. 4. Now add Haldi, sugar and salt. Mix well. Now shift those washed and drained beaten rice to this and mix well. 5. Delicious and simple Masala Poha is ready to serve. Check out my other blog " Healing Plants"
Yummy poha masala, looks so inviting.